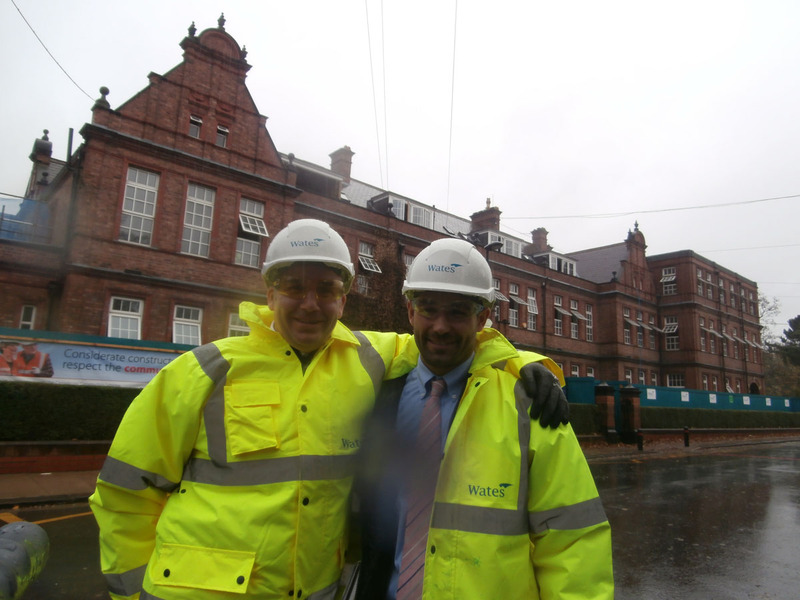 You may remember Nick White, Wates’ Project Manager, from an earlier blog post for November 11th. That Wednesday wasn’t just memorable because it was a particularly rainy day – which it was; we did suffer rather a lot of rain last Winter, you may recall. No, for me it stands out because it was the first time since 2014, thanks to a kind workman taking photos for me, I saw inside Church High once again. At the time, I was so grateful for – and excited to have – those six images. I didn’t know then I would get inside myself and certainly couldn’t have imagined only four months later spending a sunny Saturday morning being guided around the building by Nick himself. 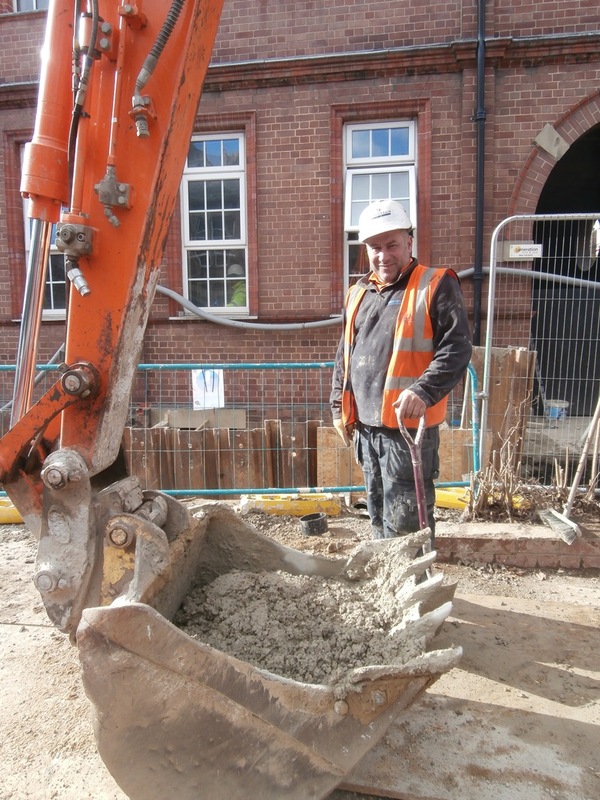 Nick White, Project Manager, Wates Site Office, Westward House, Saturday March 12th. I knew from my tour with Conal on February 24th that the stripping back of the old building had recently revealed some fascinating original features and I badly wanted to document them properly on camera. Peter, the Gateman, suggested a Saturday morning when the site would be free of workmen and Nick offered to conduct the tour. I was accompanied by sculptress Zoe Robinson (Art Teacher at both Church High and NHSG) who was keen to gain inspiration from the bare bones of the old Victorian building for a piece of original art work. 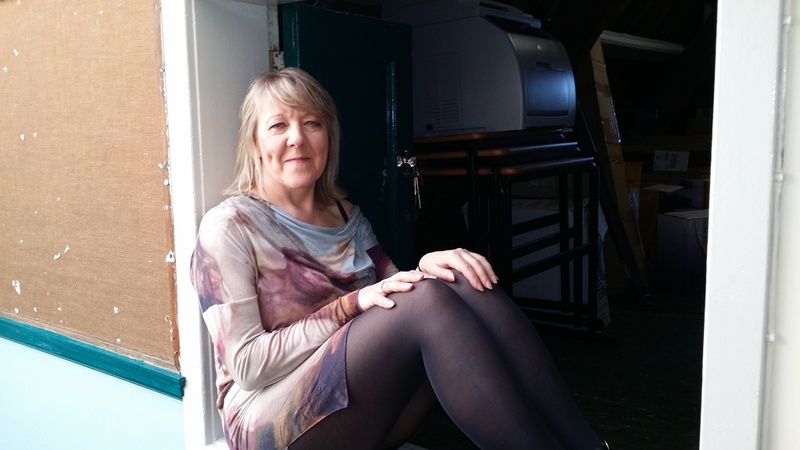 Zoe is a talented and very successful commercial artist, who is regularly represented by The Biscuit Factory Art Gallery. I felt that Zoe’s preferred medium of metal and wire would lend itself very well to the scaffolded, skeletal school interiors and Nick, who was in finishing off paperwork prior to a holiday break, was happy to oblige. 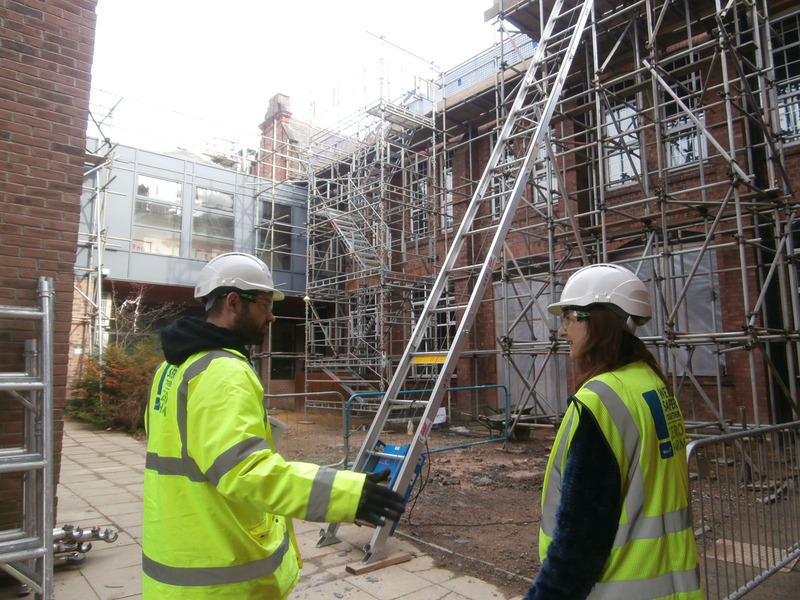 Nick talks to Zoe about the use of metal in the construction process at the Project Manager’s desk & in the courtyard. 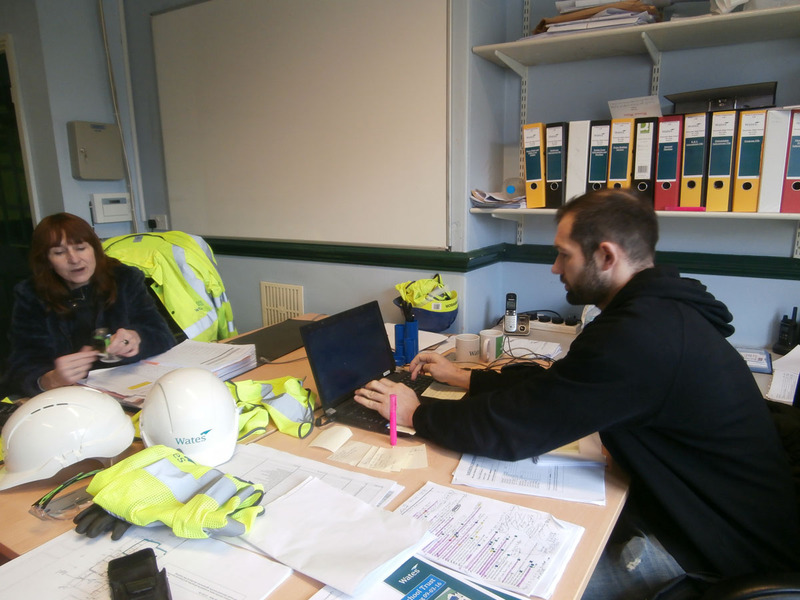 As Nick talked Zoe through specialist details of the metal work involved in various stages of the site renovation work, I was more than happy just to tag along and take my photographs. I know now that this was the ideal time to undertake a tour. Not only was it a bright, sunny morning, but the work was also at an interim stage. 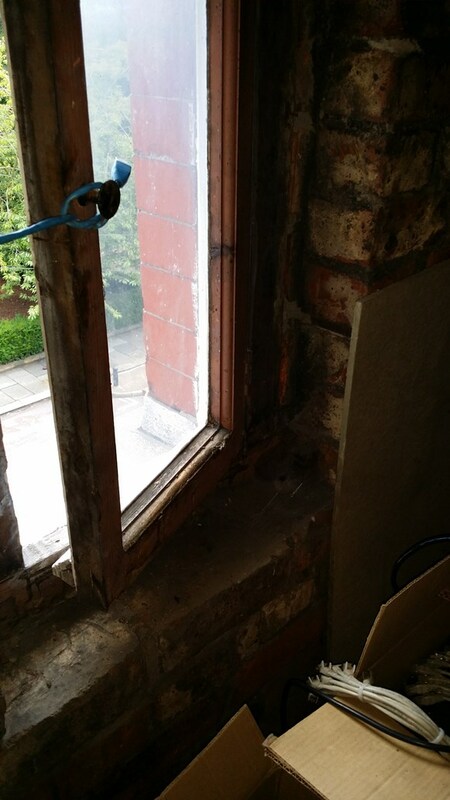 The strip out and restructuring work was now all complete and plastering had recently begun. 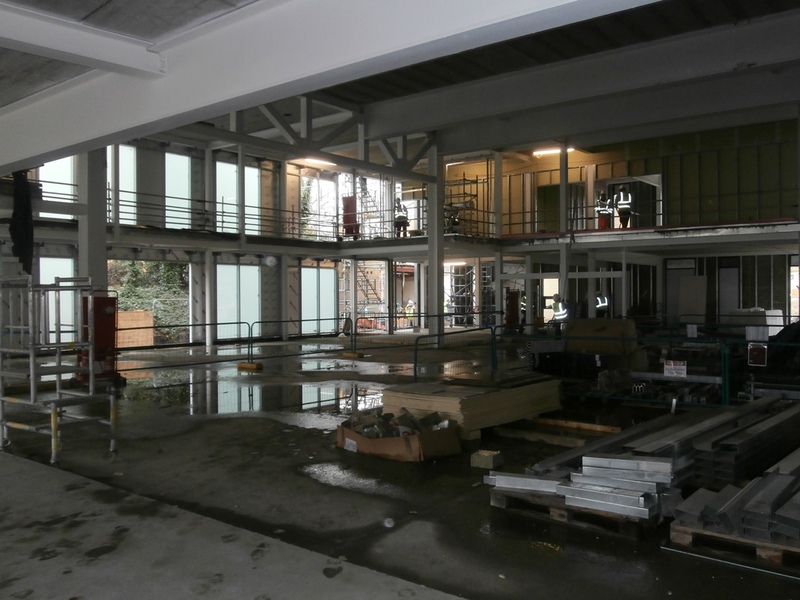 Most importantly, the stripped back internal spaces were not yet cluttered by the multitudinous building materials which would be needed for the fitting out stage of the process. What luck! I took over 250 photographs that morning, enough to make video slideshows for three blog posts: outside spaces and Ground Floor, First Floor and Second Floor of the building. As we moved from room to room, it felt like a game of ‘I Spy’ as I hunted out old architectural features standing out more now in stark relief. 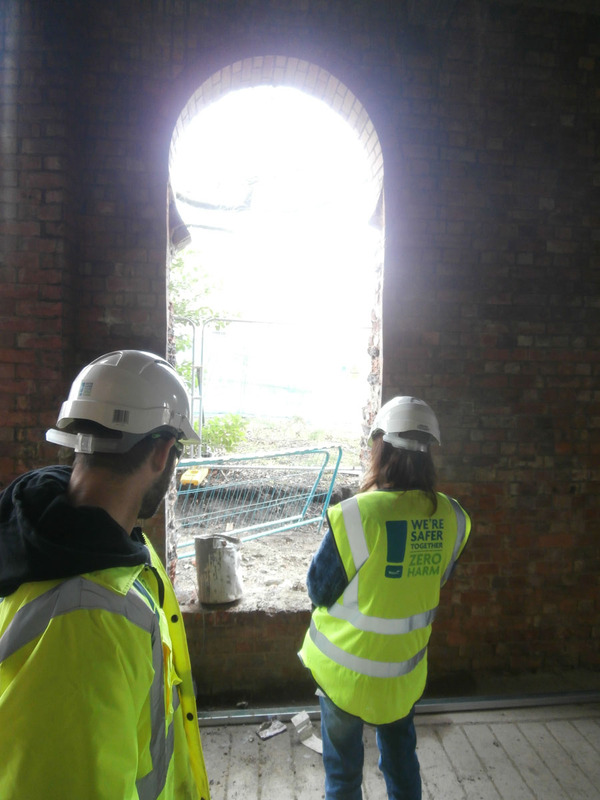 One of the circular holes in the north facade is now opened up into an arched doorway. I thought I knew the building very well indeed but was startled to be told that the bright white squares which immediately caught my eye, shining in the sunlight high up on the west wall of the 1984 Science Wing, were not newly installed. 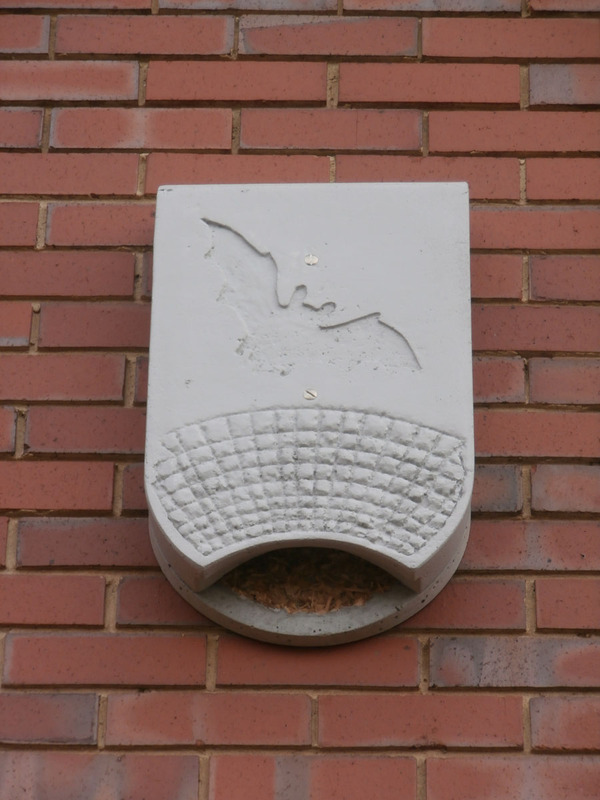 Apparently there were always two bat boxes tucked away near the eaves while I was at Church High! ‘I Spy with my little eye’ …. two odd white boxes on the west wall of the Church High Science Wing. Did you know there were bat boxes up there all the time? Well, I certainly didn’t! Along similar lines, if I asked you where the Holocaust memorial plaque was at Church High, would you be able to tell me? I knew there was one, having featured it in the 2011 School Magazine. I also knew it was destined for the courtyard but exactly where? I don’t know. However, approaching the courtyard from the rear on March 12th, eyes searching for quirky features, there it was, all of a sudden, shining in the sunlight. How had I managed to miss that? Mounted to the right of the north courtyard door, the Church High Holocaust memorial plaque glows in the sunlight today. On the opposite side of the courtyard, an architectural feature I didn’t need a game of I Spy to locate thankfully still remained in situ. 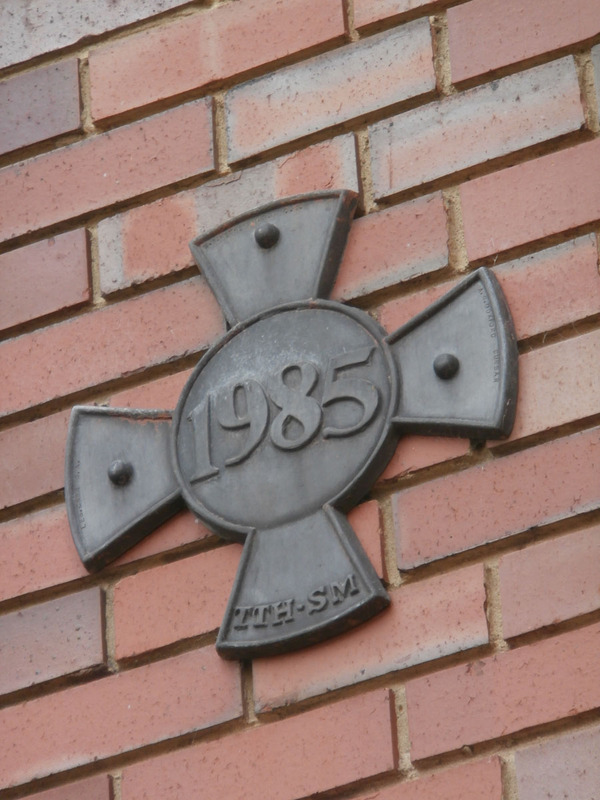 I’d always thought the shaped bronze plaque dated the building work on the extension but zooming in to photograph it, the date seems to mark the school’s Centenary. It’s always looked very beautiful to me against the rich red brick. Did you know it was there too, I wonder? 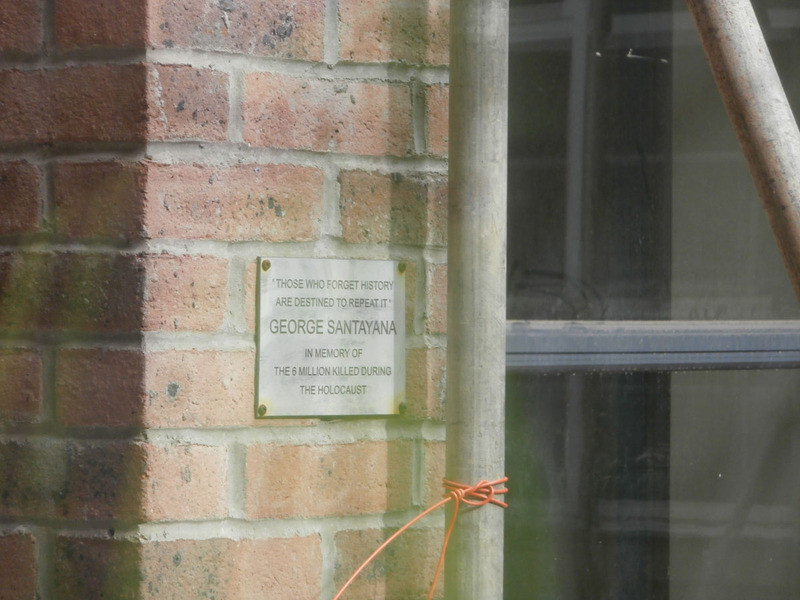 The Science Wing north wall brickwork may be full of holes, but the fine bronze commemoration plaque is still in place. Inside the building at ground floor level on March 12th two more features worthy of note caught my eye. 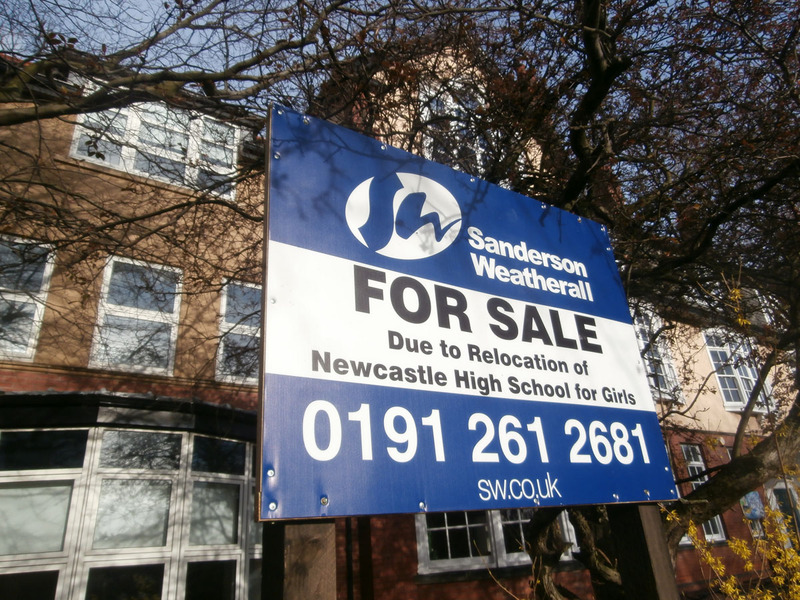 When the building opens as Newcastle High School for Girls on September 6th, I’m sure the feature which will cause the most excitement is the lift. 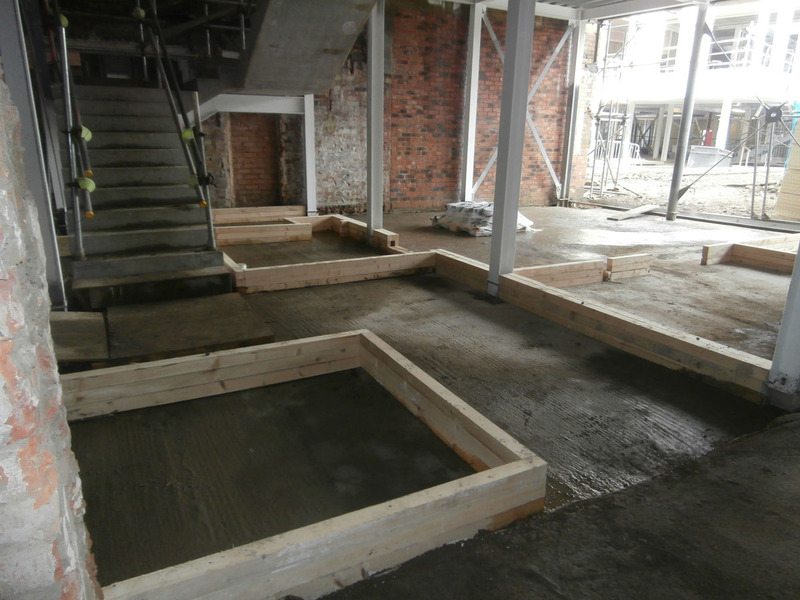 At present, the site of the lift shaft is marked by a wooden box on the ground floor. A wooden box denotes the lift shaft base at ground floor level. The other thing which caught my eye at ground floor level that day was an empty wall where the Tankerville Terrace mosaic used to be. Hard to imagine how a plain white wall improves things here. My first tour of the old building took place on January 13th; my second one on February 24th if you want to compare the changes. 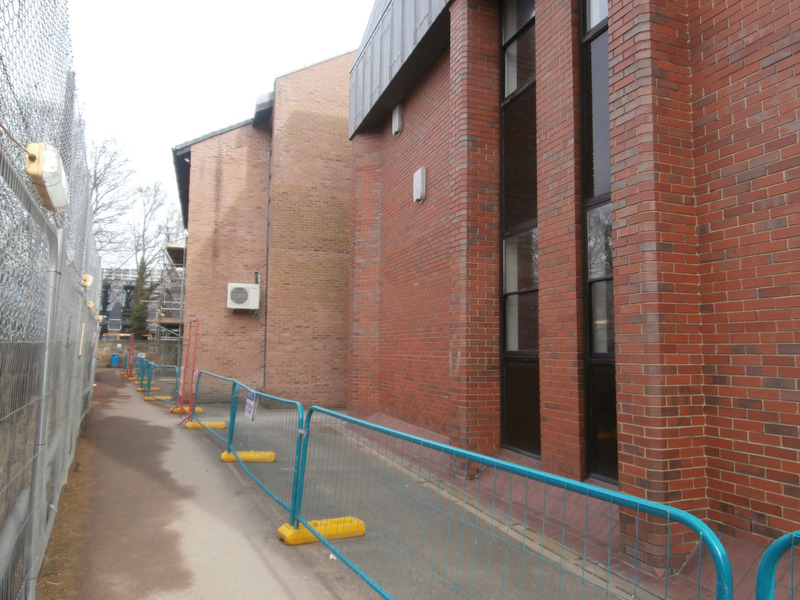 Your third site tour with me of the old Church High building ground floor starts here starting on the Chemistry floor of the Science Block and ending up in Home Economics and History in the Barbour Wing. Although not visible from the western hemisphere, March 9th saw a total solar eclipse occur. In Jesmond, it certainly felt as if we were sitting in the moon’s umbral shadow. It was cold, dull and very wet. With the passing of winter, I thought I’d got away from having to make do with shots of grey steelwork, even greyer skies and heavy rain. But clearly not. 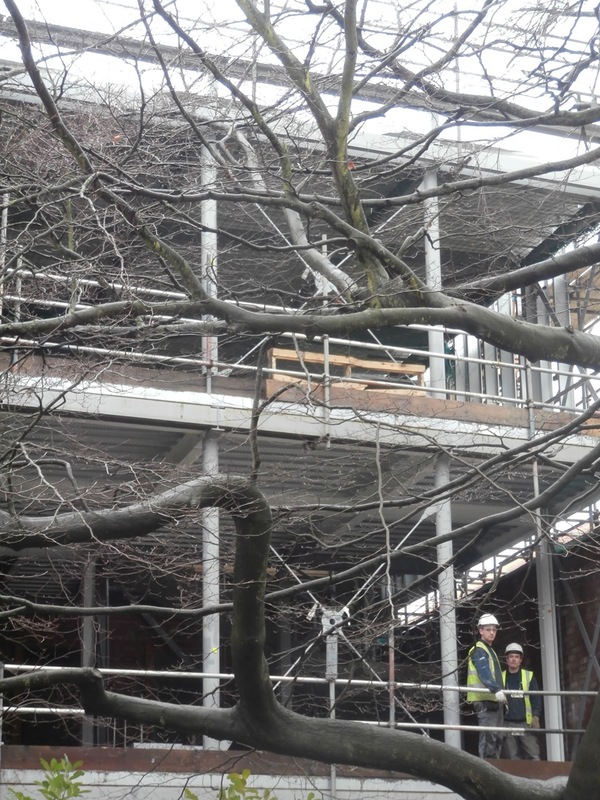 Despite progressing fast, even the intricate steelwork of the Church High old building circulation extension appeared dreary in poor light behind bare, skeletal tree branches. And once inside the new-build structure, it was even duller again. 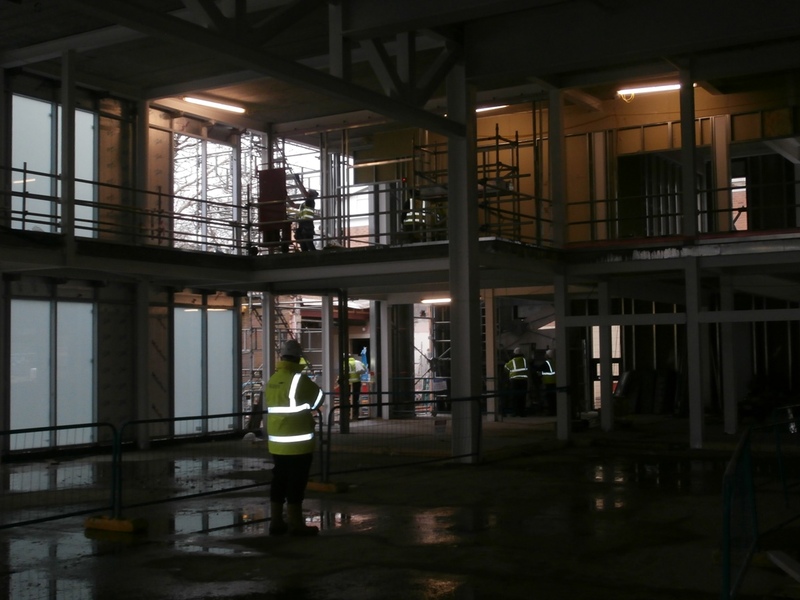 It’s still cold, wet and dull even inside the new-build structure. I believe that the plans for both buildings have changed slightly since their launch, but no updated images have been produced yet. 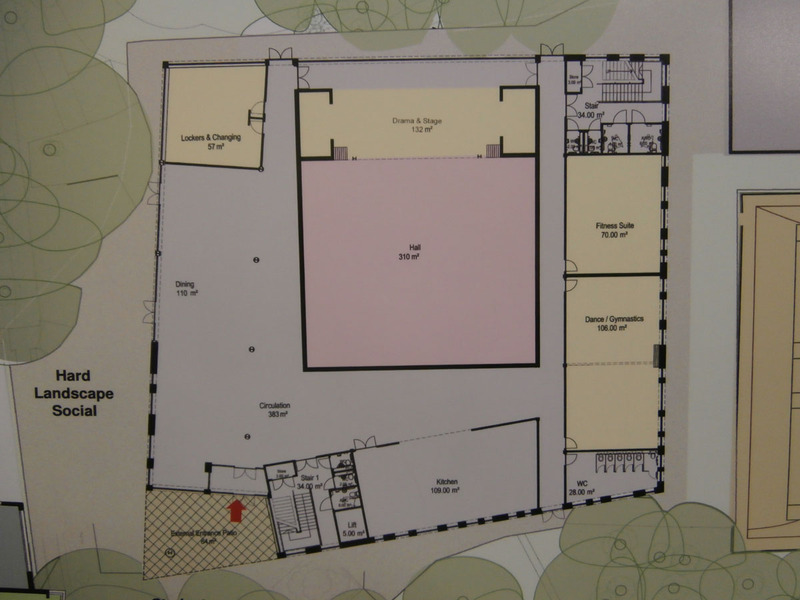 The original new build plans of June 2014 which were on display at Church High for Heritage Open Day were certainly very colourful and showed the ground floor as containing an open plan dining area, the Main School Hall, a Fitness Suite, the kitchen and two stairways. The kitchen I know was originally intended to be at the very back of the building, which makes sense aesthetically, but it was moved to the front in an attempt to lessen disturbance to St Mary’s Court residents behind us by the ‘to-ing and fro-ing’ of food delivery vehicles. Ground Floor Plan for the NHSG New Build, June 2014. 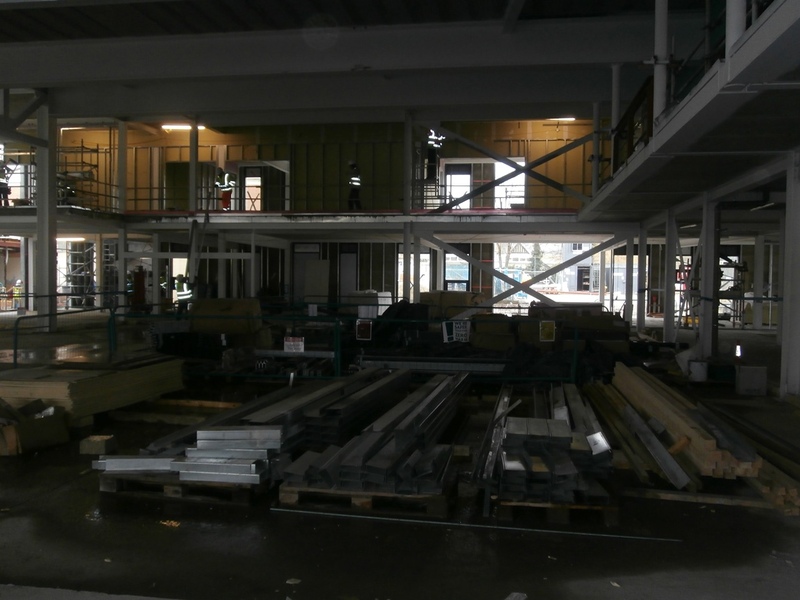 The Hall will sit in the centre of the new building’s ground floor; it is designed to extend up into the first floor too to allow more height. 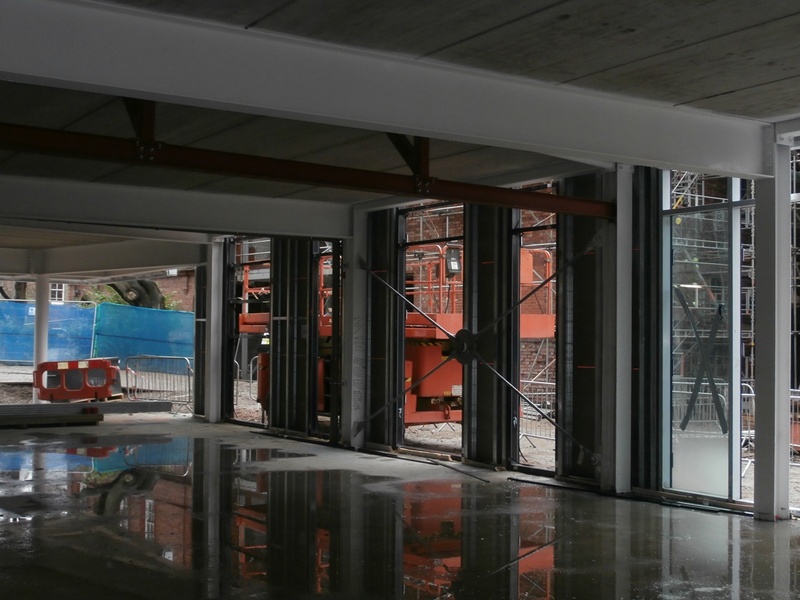 The new build’s interior is fast taking shape now and, despite steel girders piled everywhere, the double-height Hall’s footprint is clear. The double-height ground floor Hall area (south to north). 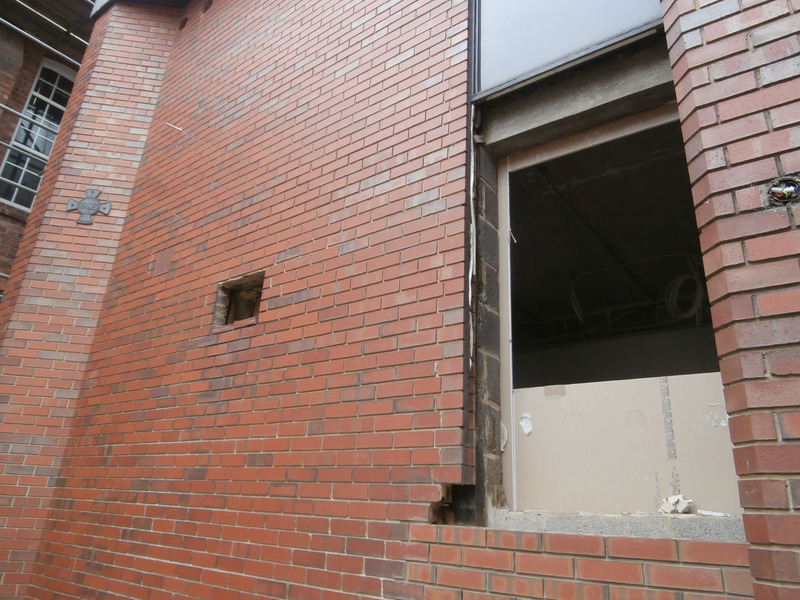 The very back wall of the building, the side furthest away from Tankerville Terrace, will be largely made up of glass. Because of this, moving towards that area today my images were a lot brighter. 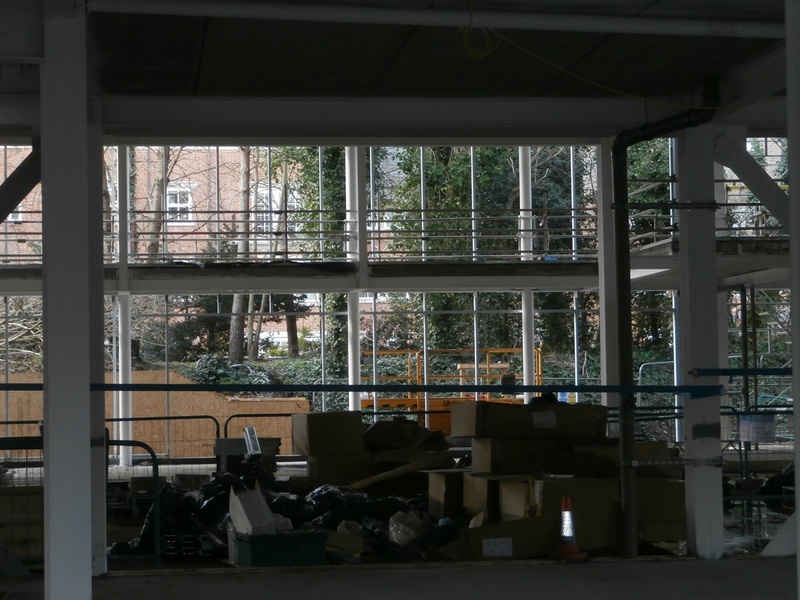 The back wall of the ground floor will be all glass windows. 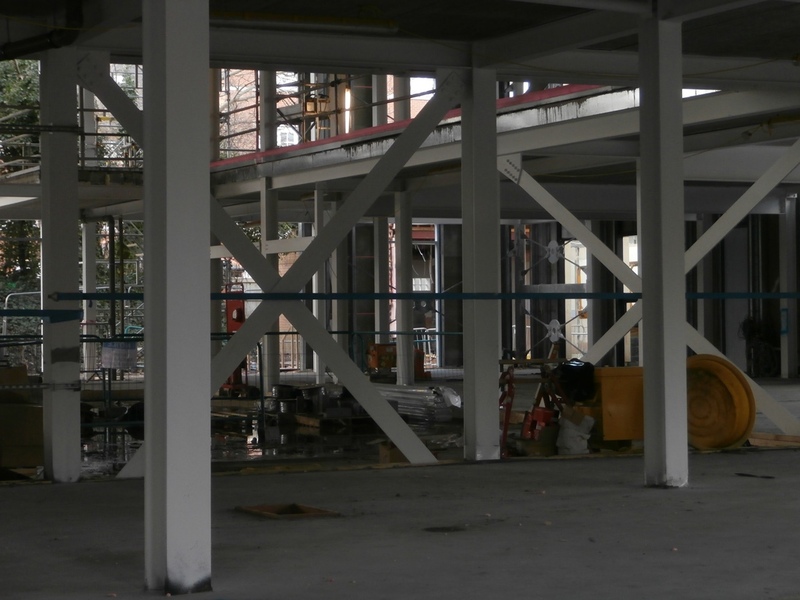 As can be seen from the Ground Floor plan, the Dining Area will be L-shaped. Its spacious open plan design will no doubt prove a popular recreation space for the girls at break times too. 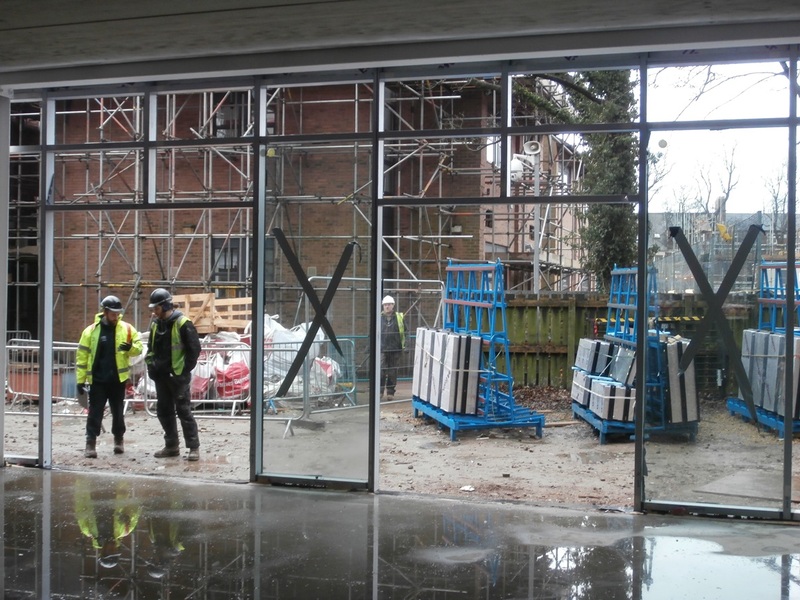 For this purpose, a glass doorway will be installed to lead out onto an area of hard landscaping forming a social space between the two buildings. 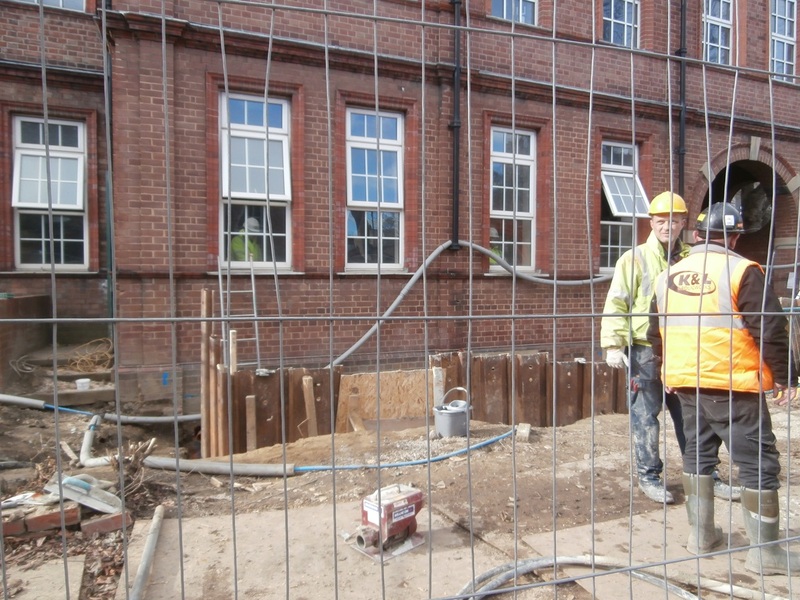 A large area of the new build’s ground floor immediately in front of the entrance and nearest to the Church High old building will eventually become the new school’s dining area. 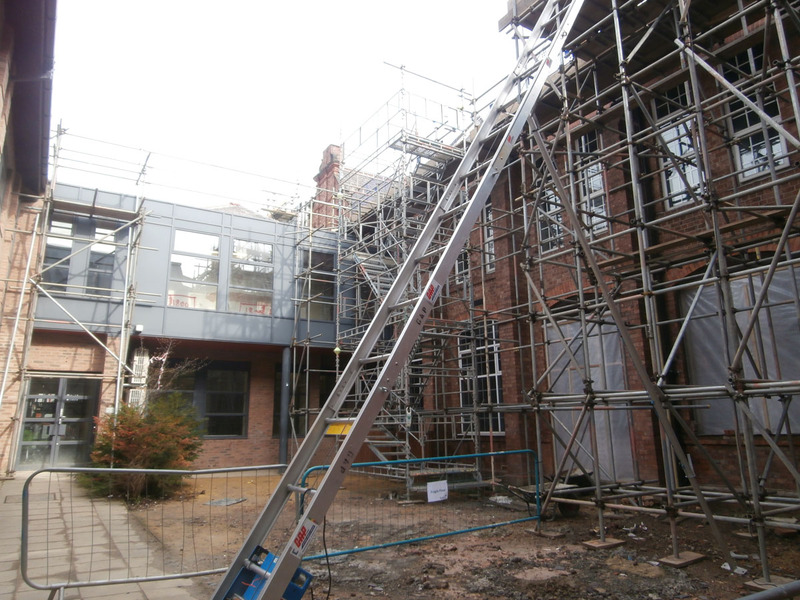 A plaque will be installed within it to mark the site of the signed ‘Topping Out’ beam (second beam from the left here). 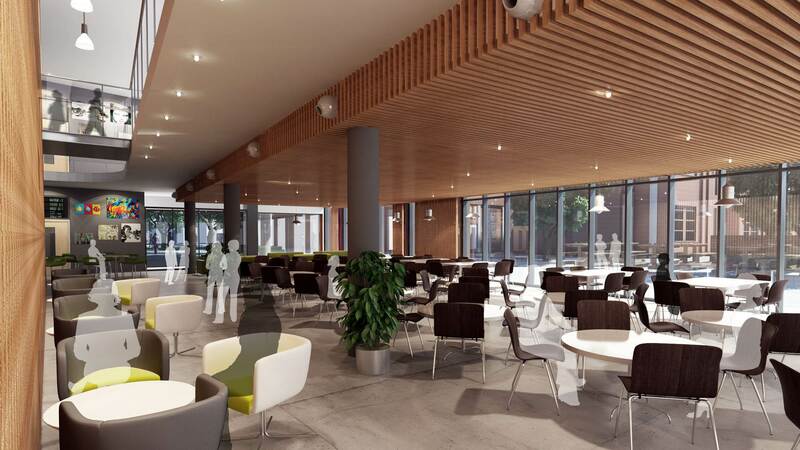 Glass doors will allow access from the dining area onto a hard landscaped social space between the two buildings, which can clearly be seen to the right of the artist’s visualisation below. 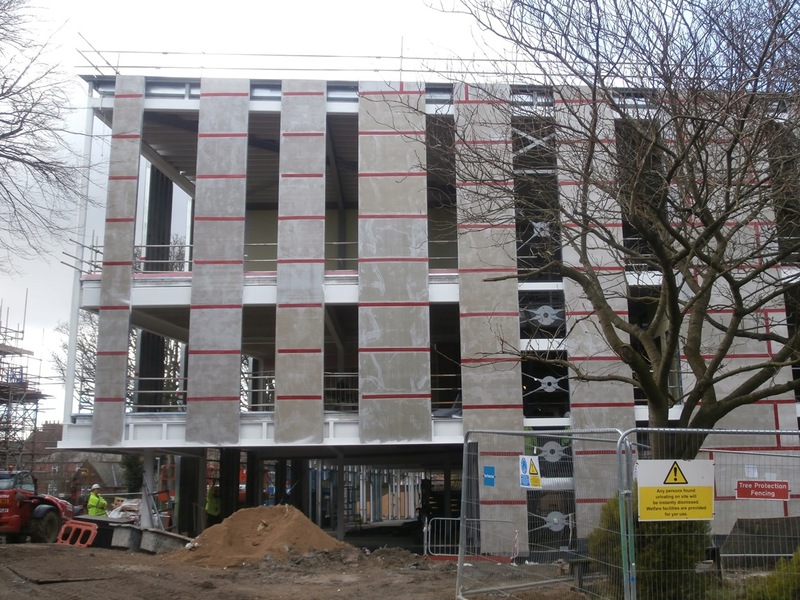 The hard landscaped social areas around the site will be created using pale grey paving stones as Nick White showed myself and Zoya Zaman (Head Girl) at the Topping Out ceremony on February 23rd. 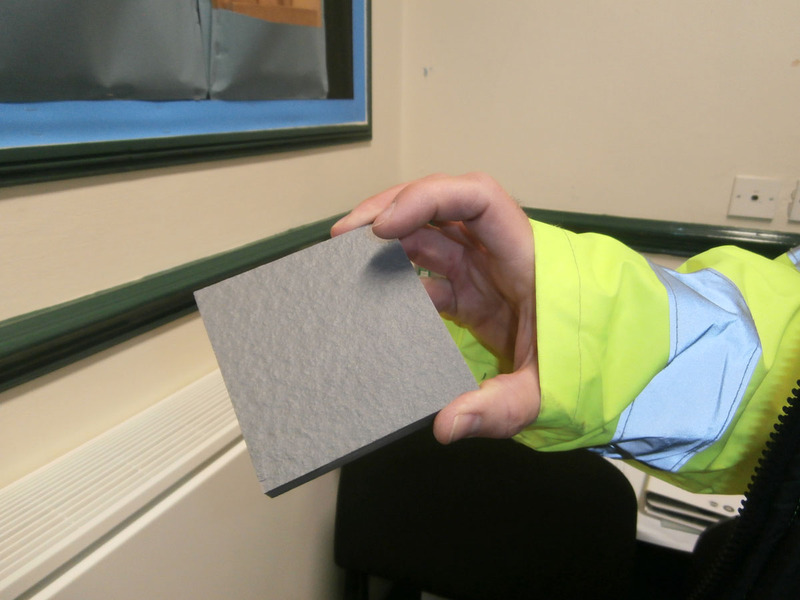 Nick White shows us a sample of the light grey paving stones which will be used for hard landscaping around the site. Whilst the prospect of such high-spec modern design features on the Church High site is intriguing, for me at least, the excitement is invariably counter-balanced by sadness at the loss of other things. 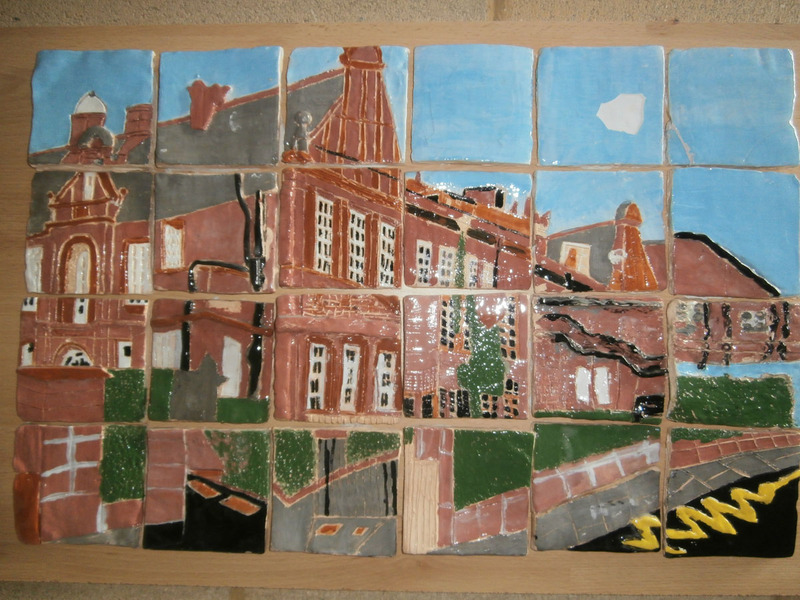 A good example of this is the large, colourful ceramic tile collage of Tankerville Terrace & the Church High building, made by the girls to brighten up the yellow breeze block walls of the back staircase in the 1998 Barbour Wing extension which housed the new art rooms. The colourful ceramic tile collage of Church High and Tankerville Terrace which brightened up the Barbour Wing stairs. 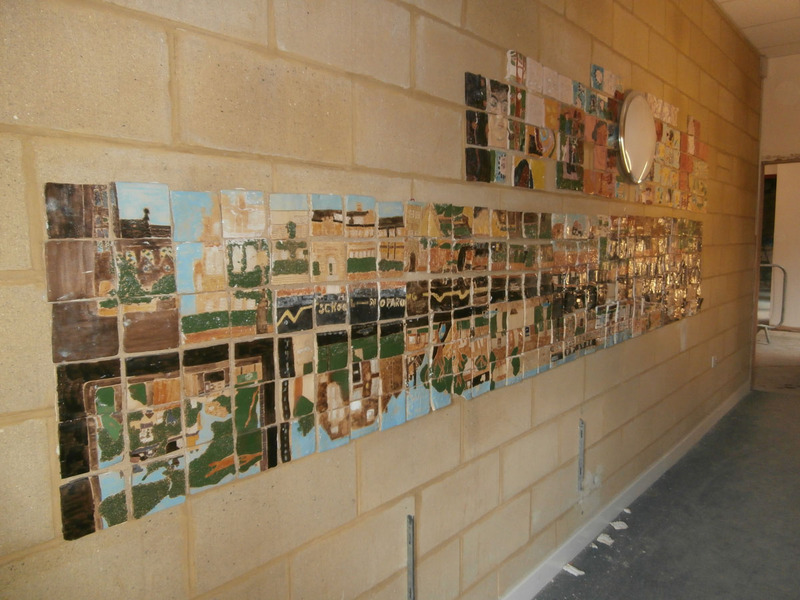 Because it had survived the strip-out and was still present when I was given a tour of the old building on February 24th, I rather foolishly dared to hope that the mosaic collage was going to be retained. That would have been a really nice touch and very fitting too, as it was of Tankerville Terrace after all. But it was sadly not to be. I had asked Wates that if it ultimately was still destined ‘to go’, it could be bagged up and passed over to me for safe-keeping. 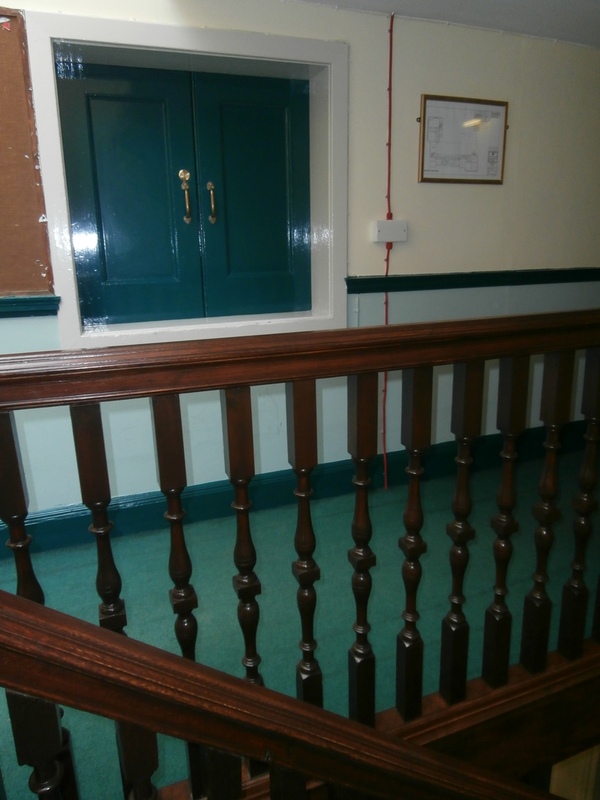 Unfortunately, as with the old staircase, it turned out I didn’t ask the right person. 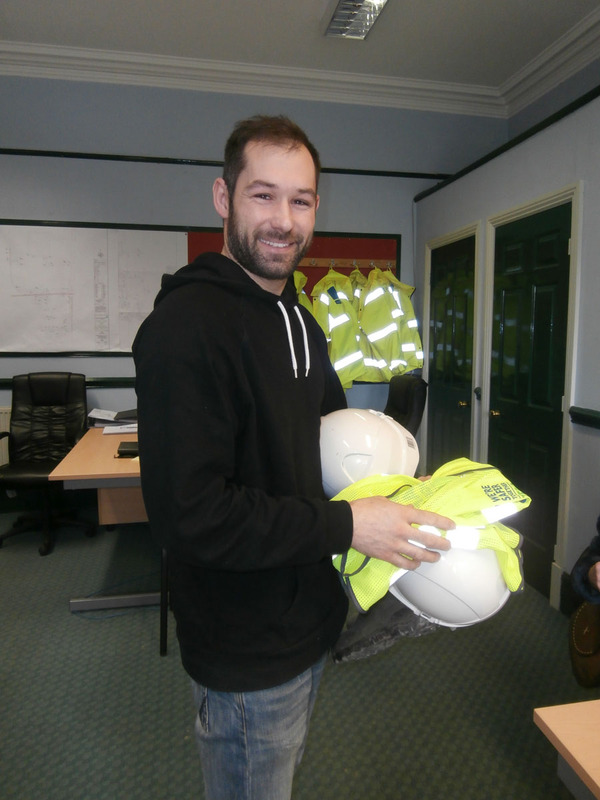 When I arrived on site today, I was greeted by a smiling Peter the Gateman who said he had a present for me. Entering his cabin I was presented with 7 ceramic tiles from the collage – a couple a little chipped – which the guys, knowing I valued the mosaic, had saved for me. 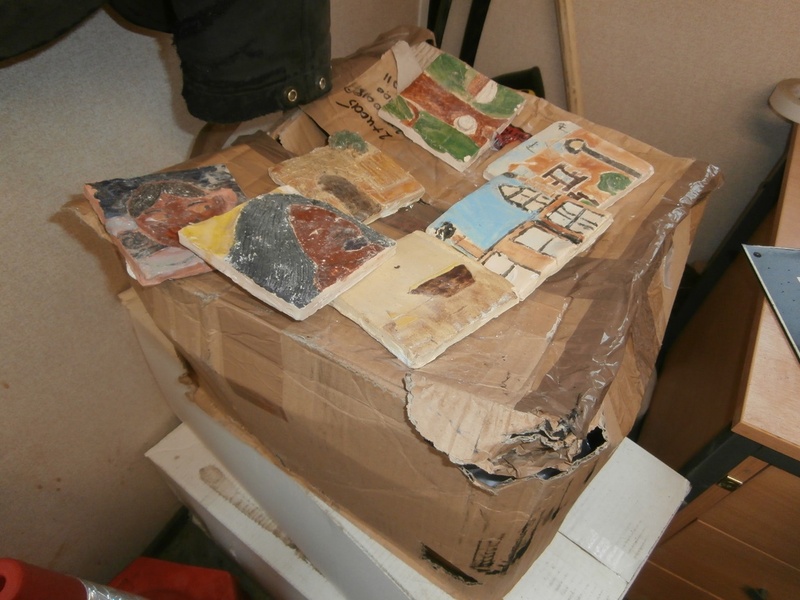 Although I was very grateful and thanked them profusely – it turned out they had rummaged through a skip to salvage the only tiles which had remained intact – my emotions were mixed. It wasn’t the first time I had felt upset and frustrated in my quest to preserve Church High’s heritage – and it pains me to know it won’t be the last time either. Peter’s kind nature led him to enthuse about the aptness of the random tiles which had survived – none of which were of Church High, I sadly noted. Variously depicting a section of a tree, sky, a male face and a female face, in an attempt to soften my disappointment Peter enthused that they could make up a little story of The Garden of Eden. It’s nice to know there are at least some people on site who understand the importance of old stories. March 2nd is the 61st day of the year (or the 62nd of this one since we are in a leap year). From this point, there are 304 days remaining before we reach the end of the year and, by my calculations, 163 days until the Tankerville site renovation is due to be completed. According to Wikipedia, March 2nd is a propitious day for technological invention: in 1791, long-distance communication speeded up with the unveiling of a semaphore machine in Paris; in 1949, the first automatic street light was installed in New Milford, Connecticut; and in1983 compact discs and players were released for the first time in the United States and other markets. So there you go! And in 2016, our project is moving forward well on all three fronts too. Heavy duty renovation work is clearly going on apace on the Tankerville site today. 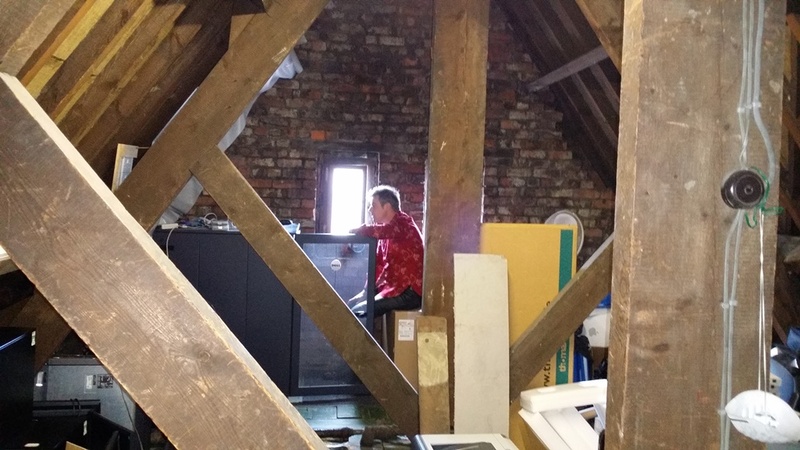 The renovation work on the Church High old building has now moved on to the Boiler Room beneath the old Dining Hall. For a while, I had thought activity in this area of the building was owing to the fact there were problems with the foundations (Heaven forbid!). However, a conversation with Eddie, Site Supervisor, today made things a lot clearer. The excavation is for under-pinning work, but only because a new concrete staircase down to the Boiler Room is due to be installed. Because of this, the wall needs strengthening. I learn from Eddie, Site Supervisor, (to the left) that Wates are in the process of under-pinning the front wall of the building. 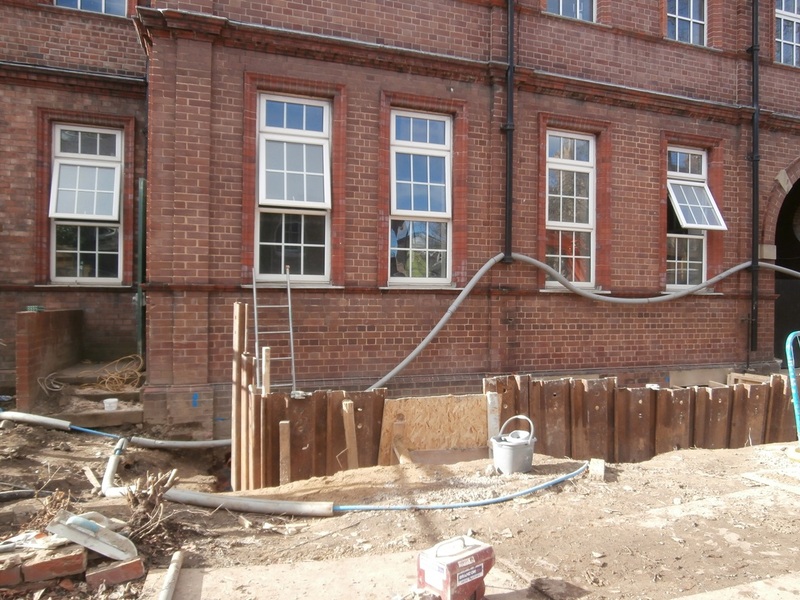 The new build construction work in the old Junior School grounds is also moving on apace now. 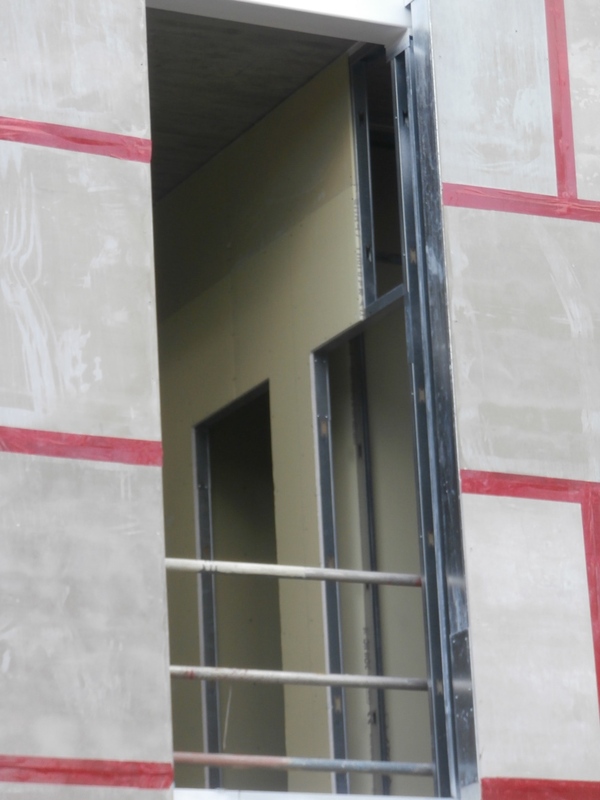 Little has changed on the outside; the lengths of concrete-board cladding still boast striking red stripes. 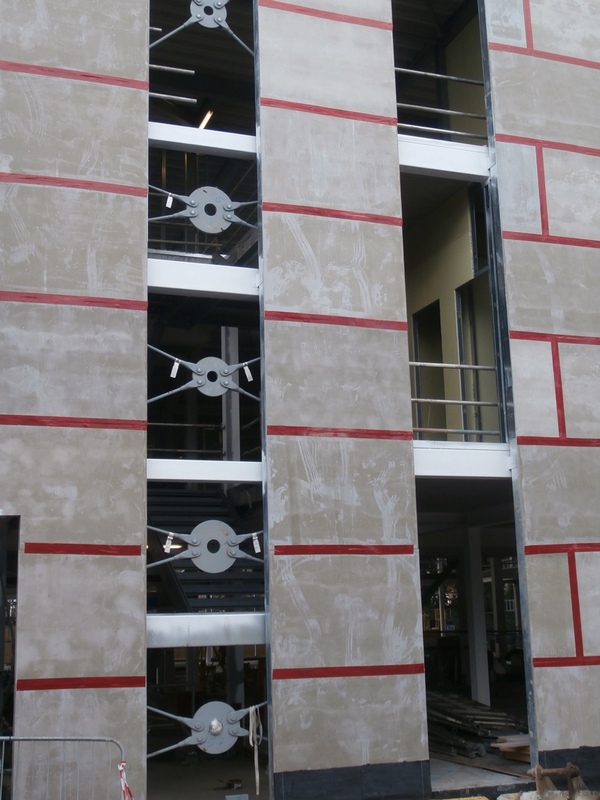 A ‘full-house’ of concrete-board red stripes on the outside. 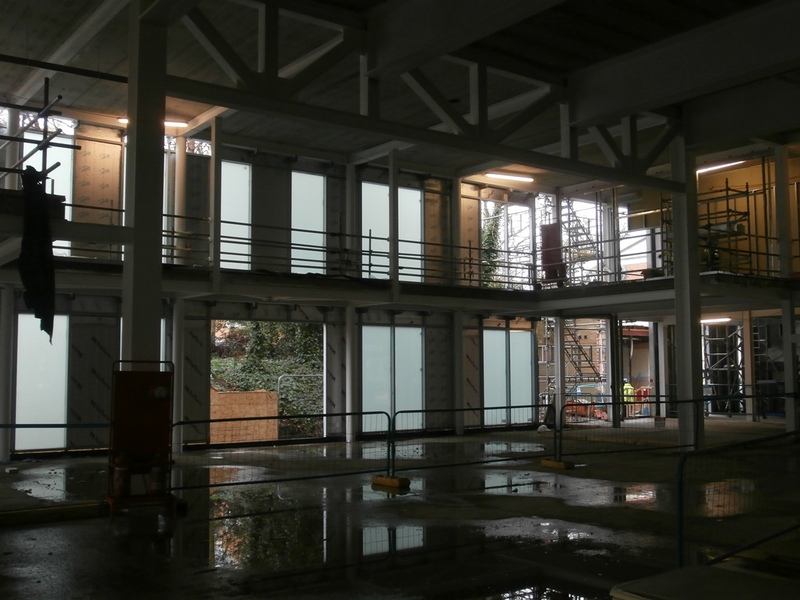 However, once inside the gate and moving towards the structure, tantalising glimpses of changes to the interior became visible through the spaces between the cladding where windows are to go. A glimpse of interior additions to new build. The metal ‘doughnuts’, as they are now called on site, are certainly a distinctive modern architectural feature of the new build design. As far as I can discern, they are intended to be visible through the glass. 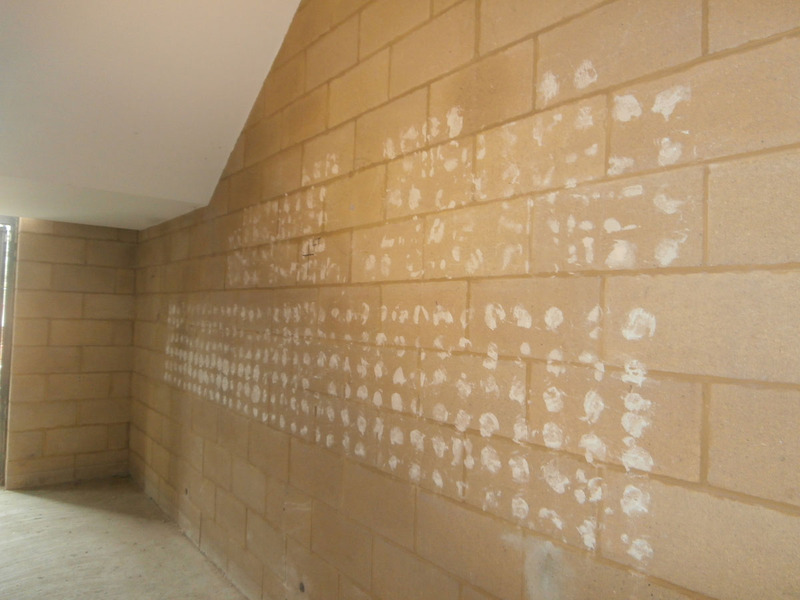 In this particular area of the building, they seem to be marking the site of an internal flight of stairs now in the process of being fitted. 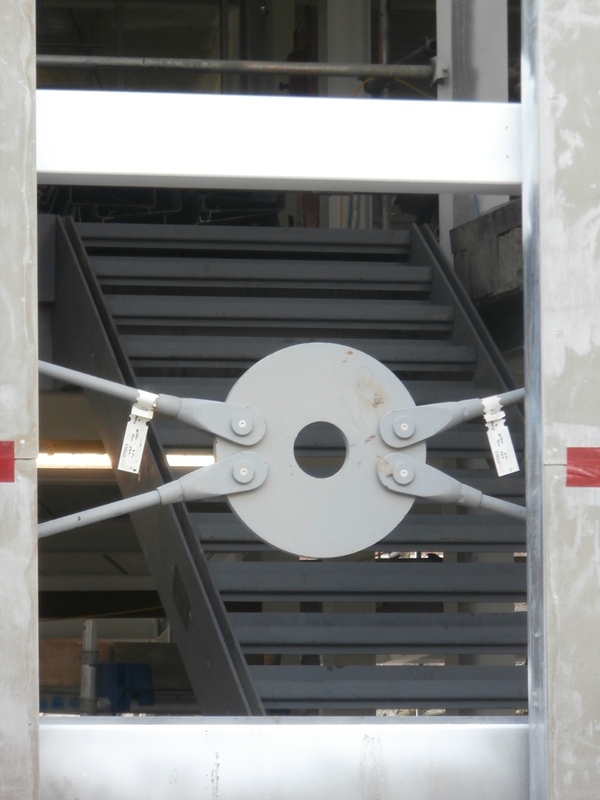 East staircase of the new build in close-up. From the plans, I seem to remember toilets are to be sited on the stairwells in the new building. The doorways are now all in place. The walls of toilet cubicles are now in place. At ground level, the new building is yet to be partitioned off into individual spaces. As when they took walls down in the old building, the guys must be working from the top floor downwards. Surveying the ground floor from where the main entrance will eventually be, to the left, only a week further on, the beam which was the focus of the Topping Out ceremony is already being absorbed into the structure. To the far left of the picture, the Topping Out Ceremony beam is already starting to be absorbed into the structure. The lack of dividing walls at present is not the only reason why the ground floor appears to be such an airy space at the moment. The lack of concrete-board cladding on the south side and back of the building now makes it clear there is going to be a lot of glass here. 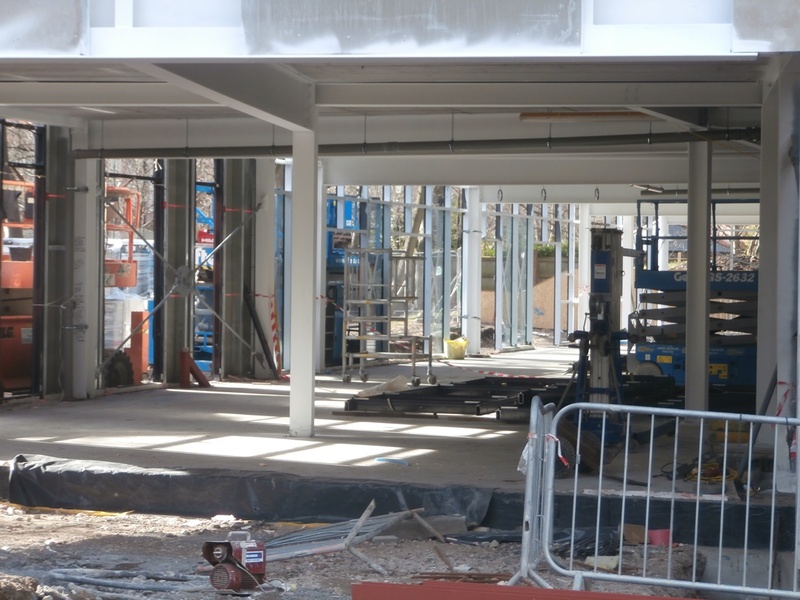 The airy open expanses of the ground floor of the new build. I left Tankerville this lunchtime to return to Eskdale feeling there was a great deal of progress to report today, which was pleasing. However, at the end of the school day when I left NHSG heading for Jesmond Metro, I wasn’t expecting a further strand of the narrative of March 2nd 2016 to have quietly unfolded while I was teaching. 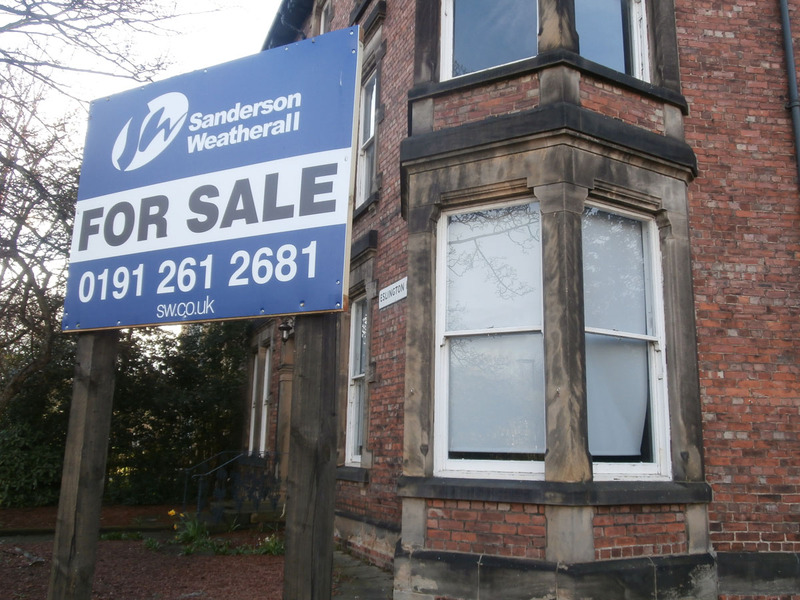 Outside of Hiley House, a blue and white ‘For Sale’ sign had gone up. 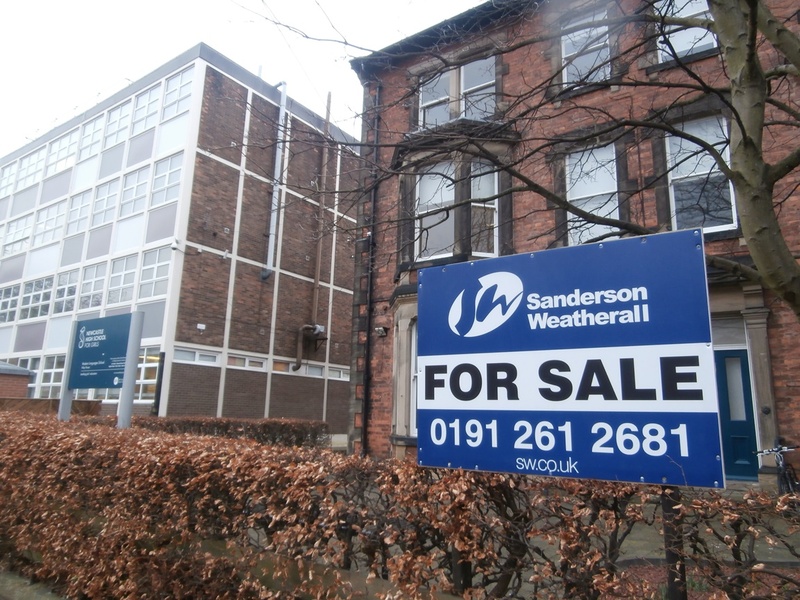 A ‘For Sale’ sign appeared outside Hiley House after lunch. The following day it became clear a sign had been erected in front of all four of the old Central High buildings deemed to be redundant once NHSG moved to its permanent home on Tankerville Terrace. For Sale sign on Russell House at the top of Eskdale Terrace. And outside the English Department in Eslington Tower too. “We shape our buildings; thereafter they shape us,” said Winston Churchill in the House of Commons in 1944. By this he meant, of course, that although buildings are the result of architects’ ideas, over time – once they have been occupied – people who live or work in them ultimately take on the qualities of the building they inhabit. 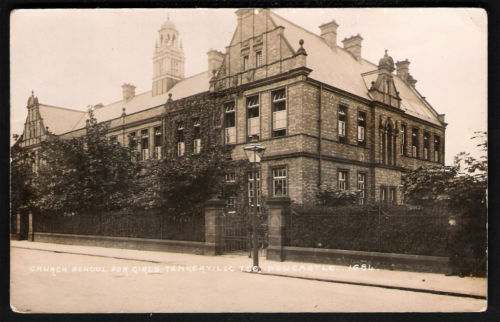 By this estimation, how lucky are those of us who have learned and worked within Oliver & Leeson’s warm, red-brick High School building on Tankerville Terrace: purpose-built as a school for Ladies in the Arts & Crafts style, subsequently nurtured and ‘eased into the future’ by others who, in the process of re-shaping her over the years, have at the same time been shaped by her themselves ? Her special atmosphere warms people up, rubs away their rough edges. February 29th is a special day. It is a ‘leap day’. The specialness of leap days never fails to make me think of Brigadoon, that magical tale of love in a Scottish village which disappears into the Highland mist returning for only one day every one hundred years. If I haven’t lost you off totally by now, Brigadoon reminds me of the Church High site now. Although it’s been painful to watch in many ways, one of the by-products of layers of the building being stripped back during the renovation, is the history that has been uncovered because of it. This is most true at the very top of building where a name from the past hid in the area of the eaves I call ‘The Mouse Man’s Domain’. 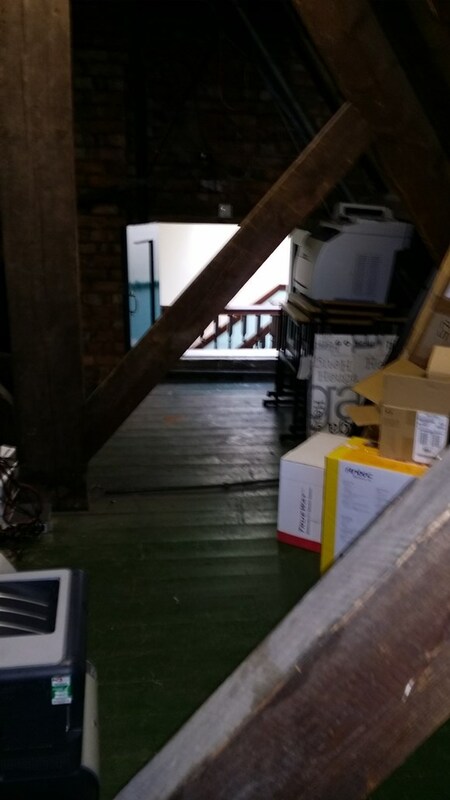 The attic room in the eaves which served until very recently as ‘The Mouse Man’s Domain’. This little room in the roof, hidden behind its even littler door, was where Steven Farrell, Church High’s IT Manager, housed the server. 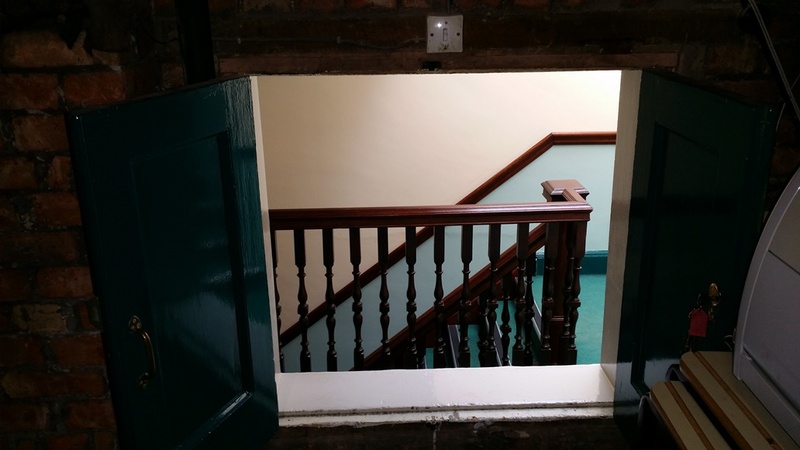 If you were ever passing when the entrance hatch to the raised-floor attic room was open, you would have been presented with this view. 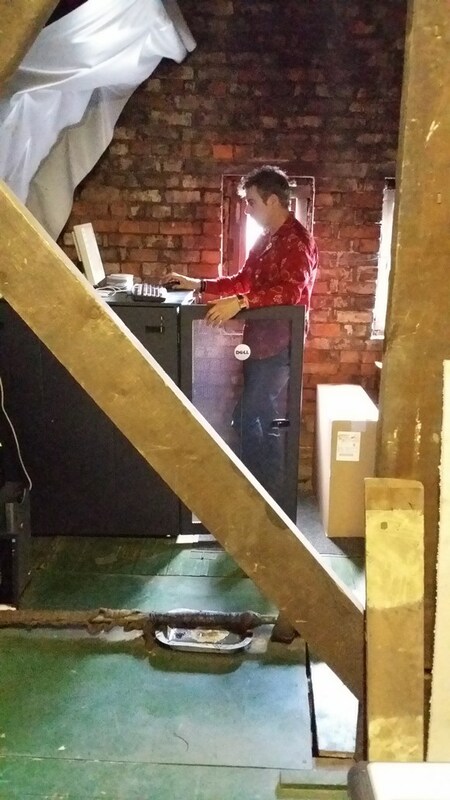 The Church High IT server was always kept up in the roof eaves. It was a strange but magical little space. 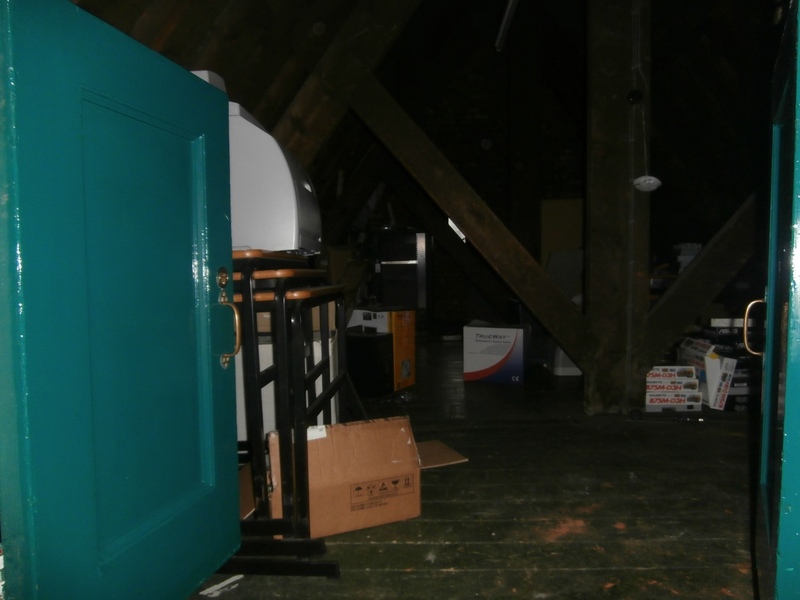 To me, it always felt like being in one of those attic rooms forgotten by time. 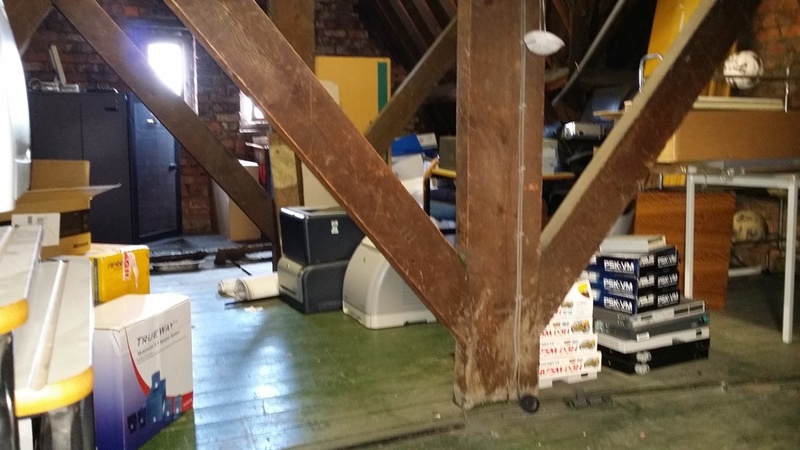 When I look at these photographs, taken in the summer of 2014 while the building was still in the hands of the Church High Support Staff before the answerphone was finally switched over to Central, I relive again the curiosity and affection with which I explored the room for the last time, more closely than ever before. If the LRC was the modern heart of Church High, then this amazing place, a creative mish-mash of past and present day, was surely its brain stem. The criss-crossing king posts and trusses were like old neural pathways ossified by time, intermingled with computer debris and, strangely, basketballs. It was to the left of the entry hatch that the Brigadoon idea took hold. An old spider’s web in one of the school’s very smallest windows. Basketballs lurk strangely amidst the ‘computer graveyard’. But the most interesting feature of all lay to the left of the hatch. I hadn’t ever had the need, time nor opportunity to explore this room fully before. It’s amazing the detail you take in when you think you are looking at something for the very last time. What I noticed etched onto an old steel beam wedged in between the brick work beside the entry hatch intrigued me enough to take a photo of it . Hidden history in the eaves: those who shaped the building. It was only recently I remembered the photograph and looked up the inscribed name: ‘J & W Lowry’. What I unearthed just further fuelled my fascination with the building. It seems the company who, at the very least, constructed the steelwork of Newcastle High School in 1889 were a very reputable firm indeed back then and were responsible for shaping many of the city’s iconic buildings. J. 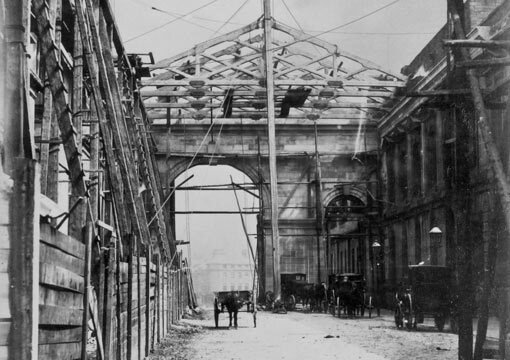 & W. Lowry was founded in 1848 by John and William Lowry and in 1862, the firm jointly undertook construction of the Central Station Portico in Newcastle as well as several Tyne riverside warehouses. 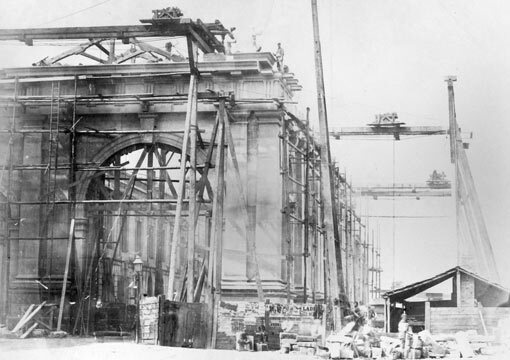 Central Station Portico under construction (J&W Lowry Ltd). 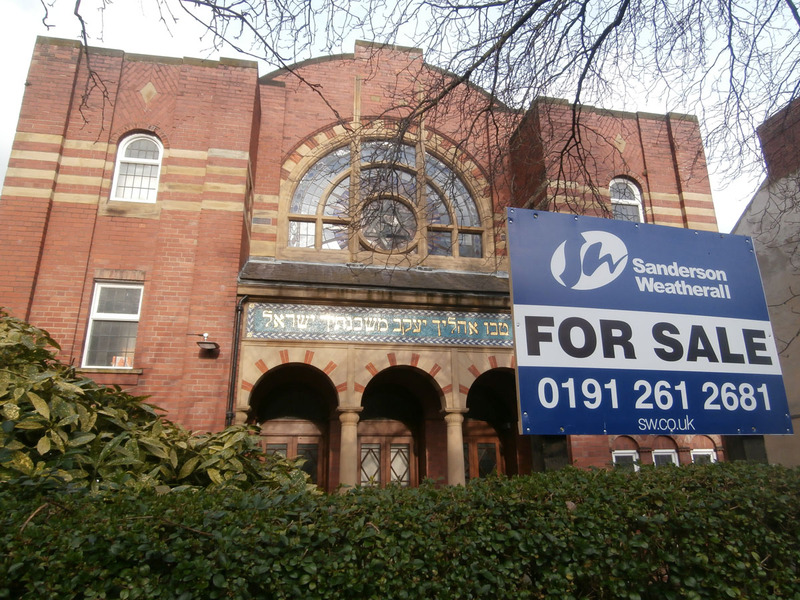 As the firm’s website makes clear, in 1867 the new Tyne Theatre was constructed next and many other notable buildings in the centre of Newcastle followed, including St. Phillip’s Church High Elswick, the Fleming Memorial Hospital for Sick Children (adjoining Church High), the Newcastle Co-operative Stores in Newgate Street, the Northern Goldsmiths Hall in Westgate Road, J.J. Fenwick’s Store in Northumberland Street and St. Matthew’s Church. When Newcastle High School was built, Walter Lowry (son of John) ran the company. Our building was clearly in very good hands and is ‘sister’ to some very well-known buildings in the city. Sadly, that historic steel beam is no longer within the building since the renovations, but the server unit remained in situ for 18 months. 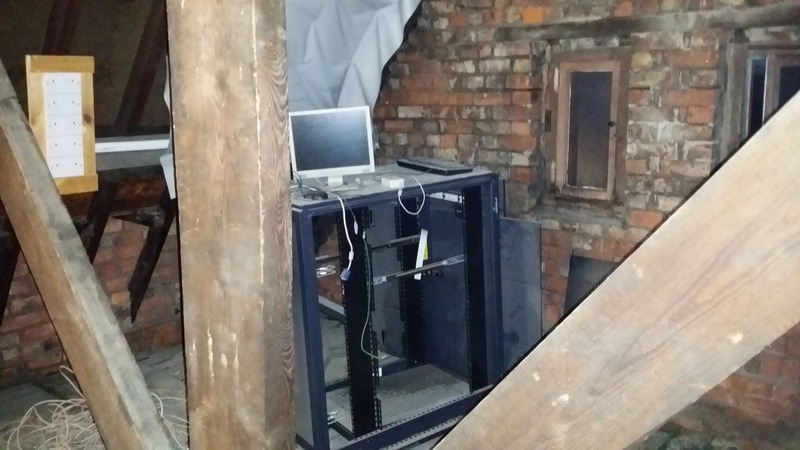 The Church High server casing still in situ in January 2016. At the moment, that magical gable attic space in the eaves still retains some of its original atmosphere, but that will change, I know. 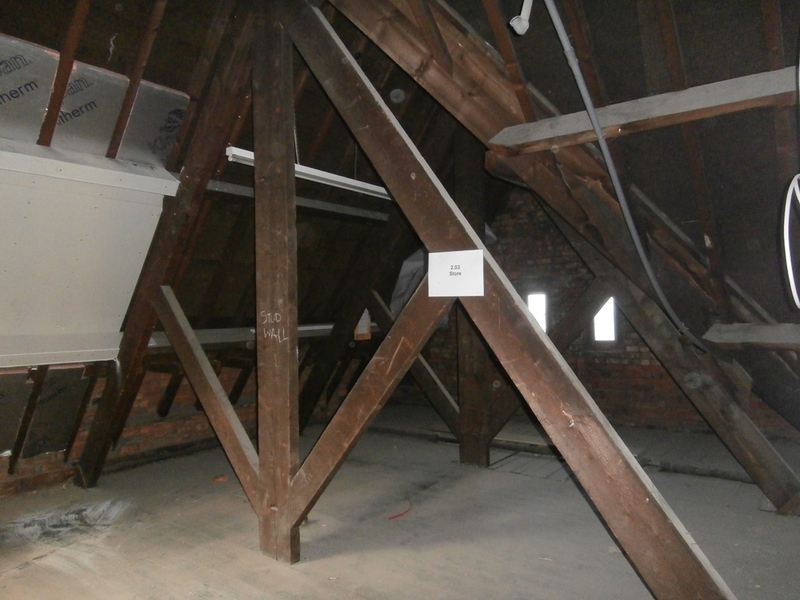 The north gable attic in the eaves as of February 24th 2016. 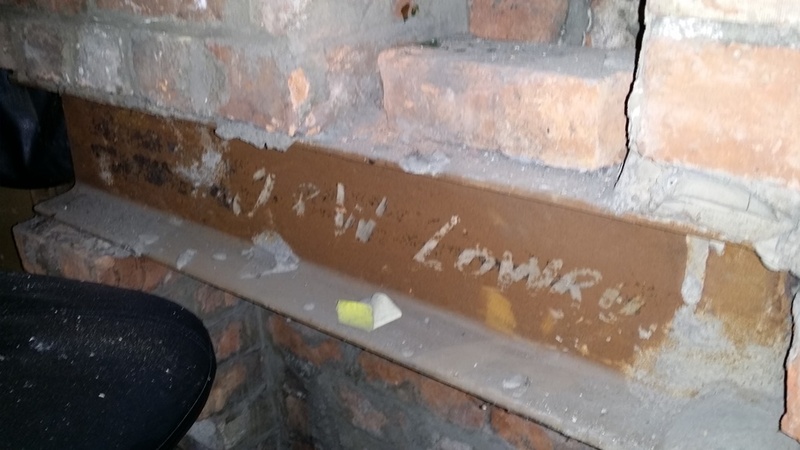 So just as Steven Farrell threaded state-of-the-art fibre-optic network cables throughout the Church High building in the 1990s, one hundred years earlier Walter Lowry’s firm had laced her with steel. Brigadoon. You see, the people who shape buildings never really leave them. If you know your Titanic, we will ‘meet them by the clock.’ And for me, that’s the most important thing to remember. The Church High Support Staff finally say goodbye to the building on July 11th 2014. 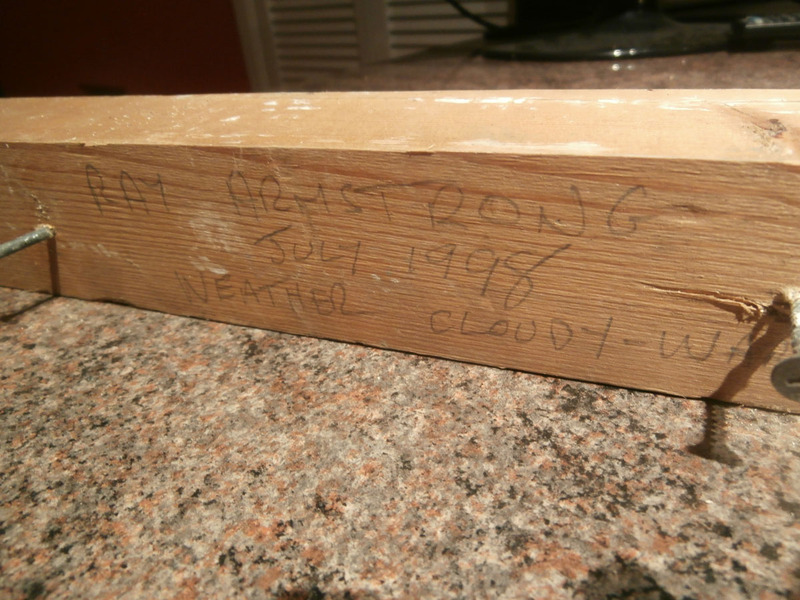 A piece of modern Church High history from the 1998 build. Ray, like countless un-named others, also added to the structure. I can’t help wondering who he was, where he is now and in what ways working within this beautiful building shaped him as a person too.